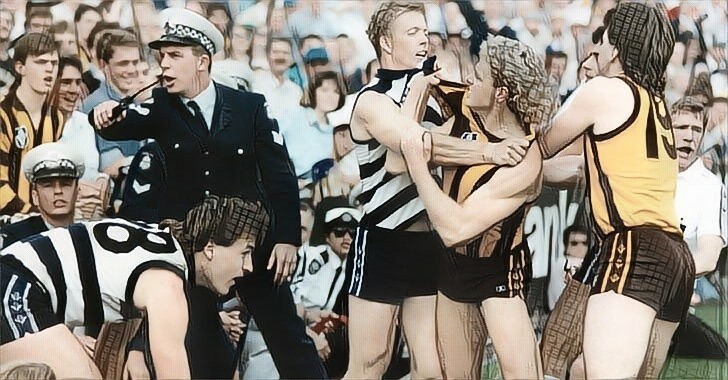 An Oral History of the Geelong v Hawthorn Rivalry Part One - The Bruns Incident — The Mongrel Punt Become a Patron! The recent history between the Hawthorn and Geelong Football Clubs has enough content to fill a book. The 2008 Grand Final set off a chain reaction that would continue to have repercussions for years. The ‘Kennett Curse’ was born, and with it a series of matches that captivated the football world. But the history runs deeper than that. So much deeper. In Round 12, 1985, the Hawks and Cats met in a spiteful clash at Princes Park. While the Hawks ran out 29-point winners, the game itself was the overall loser on the day. It was a day that spilled from action on the field, to action off it and into the courts. Behind the play, Leigh Matthews viciously struck Neville Bruns in the face as the game wound down. In Matthews’ final year, it remains the biggest blight on his career, and black eye for the game in general. For Bruns, it resulted in a jaw wired shut, five missed games, and a career somewhat overshadowed by one incident. Matthews had to be helped from the ground after the incident as well, with current AFL Head of Football Operations, Stephen Hocking, making sure that Matthews’ actions did not go unpunished on the ground. Like this? Want more? Become a Mongrel Patron. Matthews offered a written resignation to Hawthorn the night of the incident. Matthews’ behind the play hit on Bruns in 1985 saw him deregistered by the AFL for four weeks. It raised many questions about the role of police in sports at the time, as Matthews was charged with assault, and fined $1000. This was later reduced on appeal to a good behaviour bond. Amazingly, on the night of the hearing, they entered the same lift at VFL House. With Bruns entering with his solicitors from the carpark, Matthews stepped into the lift on the ground floor. Both Bruns and Matthews received boos from opposing fans for the remainder of their careers. Whilst Matthews had premiership glory to counteract his indiscretion, Bruns would fall short. Many of the quotes reprinted for this article came from newspaper reports and interviews, however several were taken from biographies of the people involved. Special credit must be given to Matt Zurbo, whose absolutely incredible book, Champions All, provided both resourcing and inspiration. Thanks Matt. Older PostIs 2018 the year James Sicily grows up?